The last six months or so, the usually calm and stagnant Upper Valley restaurant scene has had a few changes. 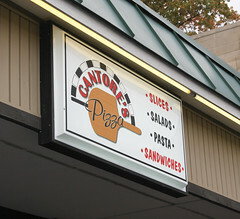 One of bigger segments changing is the pizza scene: since last summer, we’ve had two new pizzerias show up in town, Cantore’s Pizza in West Leb in Glen Road Plaza, and Ziggy’s Pizza in North Country Plaza further down 12A. I plan to review both of these places, but I’ll start with Cantore’s. Cantore’s opened late last summer, being run by local experienced restauranteurs John Kelley and Vinnie Cantore (by the way, if you were wondering… the owner of Cantore’s is the brother of Jim Cantore, Weather Channel meteorologist and former Upper Valley resident). 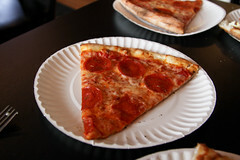 And while the Upper Valley is literally chock-a-block with pizza places (most having “Village” or “Chef” in their names), Cantore’s is trying to set themselves apart by doing a New York style pizza, and trying to use a better selection of ingredients: better mozzarella, fresher toppings, etc. And I’ll have to say, they are having a reasonable amount of success: all four slices I’ve gotten at Cantore’s have had the basic qualities I look for in a good New York style slice: A fairly thin crust (I do think they go a little thin) with a really good amount of toasting from the oven, a sauce that’s primarily tasting of tomatoes and not salt or sugar (not overwhelming the crust), decent mozzarella cheese amply applied, and a good selection of quality cold cuts and veggies for toppings. The result wasn’t earth-shaking, but it was quite a decent and satisfying slice (which is more than I can say for the majority of the area’s pizza). I think both the crust and the sauce can use a bit of improvement, but they’ve already got a good thing going here. Where I think Cantore’s is really standing out, however, is in the rest of their menu. 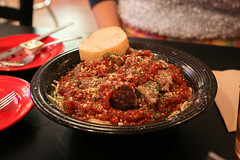 They’ve got a rather good assortment of other Italian dishes on their menu, ranging from spaghetti and meatballs (shown here), to lasagna, to calzones. It’s a good assortment, and they seem to do it well. The spaghetti, for example, was nicely cooked and not the typical “overcooked and we’ll keep it in a steam tray” sort of pasta you usually get at little joints that primarily do pizza, and both the meatballs and the marinara sauce were quite nicely done and flavorful. The meatball even had a nice seared crust on it, which is one of those things I’ve always liked in a good meatball. The calzones and lasagna I’ve had have been rather nicely done as well, and served in generous (but not overly gigantic) portions. But there’s one odd little item hiding in the menu that I did want to point out: hiding amongst the various grinders is a little gem of a meal special: the $5 burger and fries special. That’s all it is, a burger and fries. Served up on a Ciabatta bun instead of a normal hamburger bun, this makes for a slightly non-traditional burger, but it’s otherwise some pretty good burger action. A nice sear on the meat, and some nice lettuce, onion, and tomato as toppings. 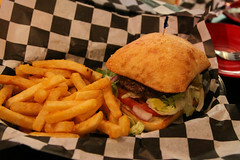 Add a good heap of fries in, and it’s one of the better $5 lunches out there in the West Leb strip. Nothing fancy, but, hey, it’s $5. And finally, they’ve got decent taste in beer, having at least two or three decent regional brews on tap at a time. So, overall, Cantore’s has some good NY slices, some decent Italian entrees, and a few other surprising specials. While I’ve only dented the menu there, I’m hoping to have several more trips to Cantore’s. It’s actually not bad at all.